This retro felt and toilet paper tube napkin rings are a great foil for your paper napkins, plus they’re fast and easy to make. Use them wherever you need an injection of 70s earth hues. Download and print out the owl pattern. Cut a rectangle of yellow felt 3″ long (~8 cm) that just fits around the tube. Squirt glue on one side of the felt. Center the cardboard tube on it. Hold the felt in place on the tube, then tuck the ends to the inside. Let dry. 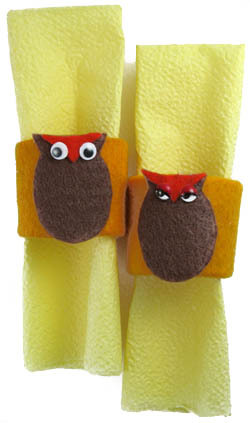 Using the downloadable owl pattern, cut an owl body out of brown felt and an owl nose out of orange felt. Glue the owl nose to the owl’s head. Glue two wiggly eyes on the owl’s head. Glue the finished owl on the felt-covered tube. Let dry.